In the 16/17 foot hull models, the fishing oriented center console MONTAUK model is assumed to be the most popular. It's so popular, in fact, that for many people the terms "Boston Whaler" and "Montauk" are synonymous. 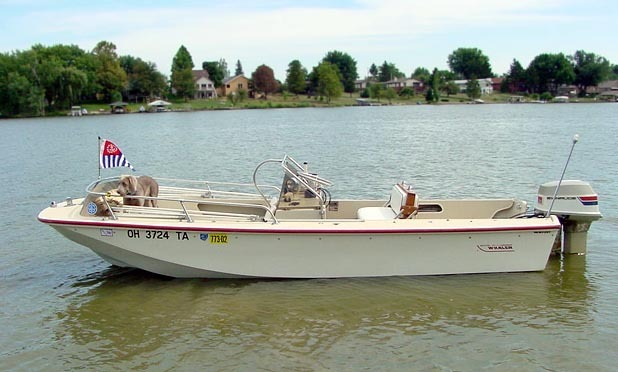 But there is another 16/17 foot model that sold a very significant number of boats for Whaler: the NEWPORT. 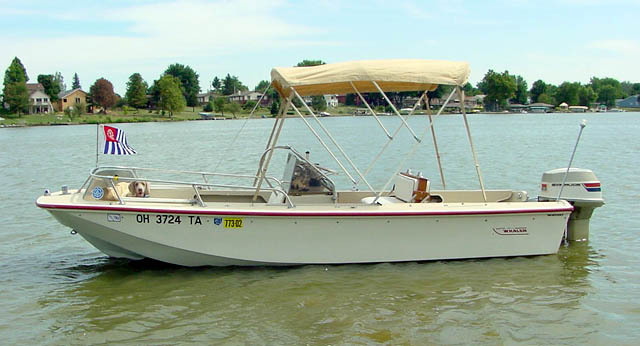 The classic Newport model was introduced in 1975, providing Whaler buyers with a more versatile boat, particularly for use on inland lakes. The helm was was built into a large console that extended from the starboard gunwales. Seating for the helmsman was provided by the classic Reversible Pilot Seat design. The helm is mounted lower than on a Montauk, but the wheel is angled upward to give appropriate height. On the forward side of the console there are two upholstered bucket seats for passengers. The rear of the cockpit was open and could be ordered with an optional casting platform. Water skiers could order a ski-pylon accessory. The deck was wrapped with wider gunwales than the Montauk. This also created some storage area in the cockpit. Perhaps the wider gunwales made getting into the boat at a dock more secure? A stylish red rub rail was another trademark of the Newport. While the Montauk was the choice for the diehard fisherman, many families opted for the Newport, a slightly more expensive model, too. "I am sending you some photos I just took of my 'new to me' 1976 Newport. I ran across the boat when my father purchased a new Ski Nautique from a dealer in Northern Ohio. While he was discussing the new ski boat with people, I had a chance to ask the dealer a few boating questions. We got to talking about Whalers and the little 11-Sport I had. The dealer said he (personally) had a 17 foot Whaler that a couple, who owned the Whaler for over 20 years, traded in on a new ski boat for their son. I asked a few more questions and left it at that. "Three or four months later I decided to give the dealer a call and ask him if he was interested in selling the boat. He said he was not interested in selling as he was going to clean up the boat and keep it for himself. However, he did tell me to keep checking with him as he may change his mind. Well, about six months after my first follow-up phone call and the day after I sold my 11 Sport, I called again. He must have been very busy with work because he told me to get in my car and come buy the boat before he changed his mind. The next morning I was at the front door of the dealership awaiting his arrival. After a brief inspection of the boat I was hooked (literally, the boat was hooked to my Explorer) and I was heading back home. "I spent a full day just cleaning and waxing the boat and sorting out all the things that needed repair. The Newport turned out to be very clean and original. The only repairs were mechanical related and I began immediately. I bought a new Teleflex steering cable and new wiring harness for the Mercury 85HP engine. The new wiring harness did not solve my problem so I put on a new ignition and stator. I still was unable to get spark, so I made an appointment to have the mechanic diagnose the problem. Well, the local Mercury guru was backed up for four weeks so I had to resort to sitting in my boat on the trailer. Shhhhhh... I even put the boat in the water one Saturday and left it at my parents dock at the lake, just so I could sit in it ON the water! While I was waiting for the mechanics appointment, I ran across some friends of the family who had a boat they wanted to get rid of. They told me they had bought it new in 1974 with the 85 HP V-4 Evinrude engine and had only used it a documented 189 hours. So, I struck up a very good deal, picked up the boat on a Monday and had the Evinrude 85 HP on the back of the CMC PT-130 Power Trim and Tilt bracket by Friday and was on the water Saturday. Regrettably, I had to take off the Morse controls to fashion on the Evinrude controls. However, my winter project is to convert the controls back over to the Morse MT-2 shifter. "The first time I got the boat up on plane I had a smile from ear to ear and was like a kid riding on his first Big-Wheel. I absolutely enjoy this boat and the fabulous feeling it has while on the water. The Evinrude engine runs very strong and quiet! I am planning to add a tachometer, Garmin GPS 176c, and a few other odds and ends. 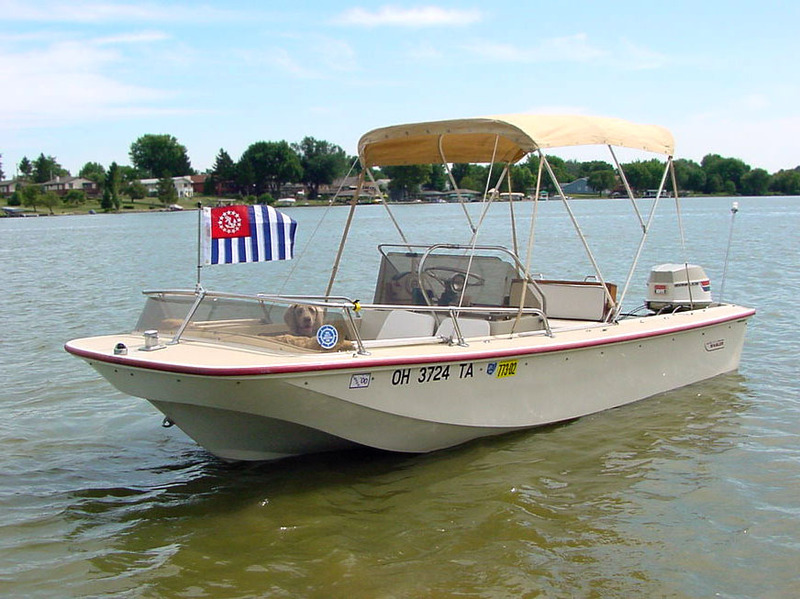 For now the boat will spend its time on Lake Choctaw in London, Ohio and a few other lakes around central Ohio. 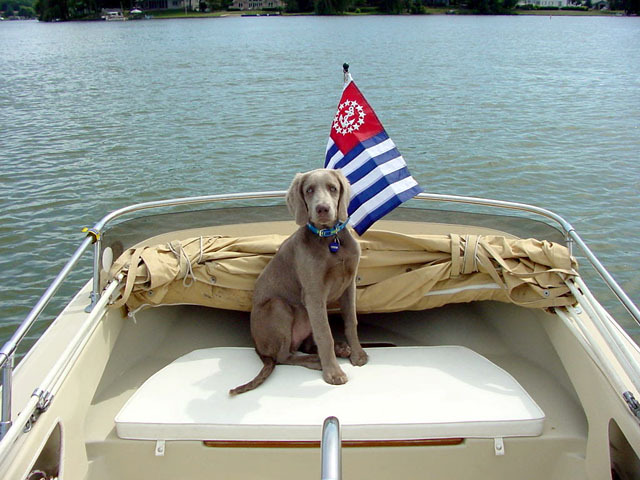 However, I plan to take to boat over to Put-In-Bay next year and plan to attend the Port Clinton Rendezvous in 2003! I have sent pictures from a few different angles while I was standing on the shore at Lake Choctaw. 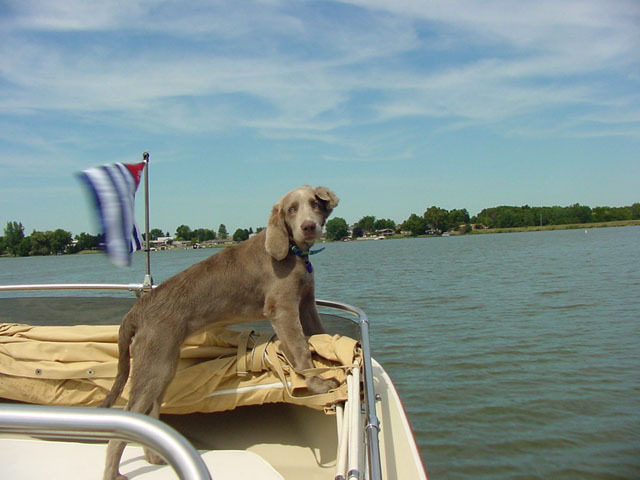 To make my wife happy, I have included a photo or two of the boat with our dog, Sloan, who is a Longhaired Weimaraner puppy. "I also have the original Mills Sun Top and Mills Forward Shelter on the boat! "I hope you can include these in the Cetacea someday!" It is often said that if you are looking for a well-preserved Whaler, look for one from a fresh water lake and a seasonal boating area. Jeffrey came across this immaculate Newport in Ohio. The natural canvas color Sunbrella fabric looks great. Having a red rub rail is a mark of the Newport model. With the canvas stowed you can see the boat's overall profile. The engine has been mounted on a CMC power tilt/jack plate, setting it back about 6-inches. Wider gunwales were one distinguishing feature of the Newport, along with storage compartments molded into the cockpit bulwarks. 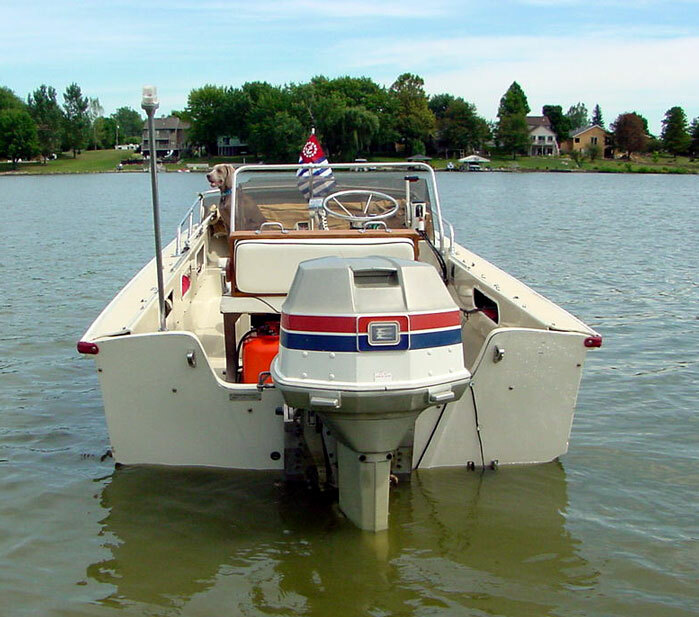 The color scheme of the 1974 Evinrude engine is a perfect complement to the boat's Desert Tan gelcoat. Note the riveted metal builder's hull number tag on the port side of the transom. The bow area contains the folded canvas, as well as a nice seat or casting platform. The white cushion helps to show the warm hue of the hull's Desert Tan gelcoat (that goes beaautifully with the natural canvas color fabric. Well-trained puppy Sloan sits patiently, waiting for his next dog biscuit. Choctaw Lake provides the setting for this classic photograph that shows all the features of the Newport. If the State of Ohio requires any more stickers to be affixed to the hull, this Whaler is going to start looking like a NASCAR racer! Note the sturdy Sampsom Post mooring bit on the bow. The red/white/blue of the United States Power Squadron flies from the bow pennant (actually a slight breech of flag etiquette!). The page has been accessed 40619 times. This article first appeared August 21, 2002.